For those of you who know me as the book blogger T.Y. of The Lit Connection, you’ll remember how I loved the merry stuffing out of The Witch of Blackbird Pond. While that old WordPress blog now lies fallow, I’ve decided to pluck some of my more personal posts from the weeds and retro-blog, so to speak. The following post, entitled A Love Letter to My Favorite Book, was published 6 years ago. I’m re-posting it here with all its cringe-worthy mistakes intact. 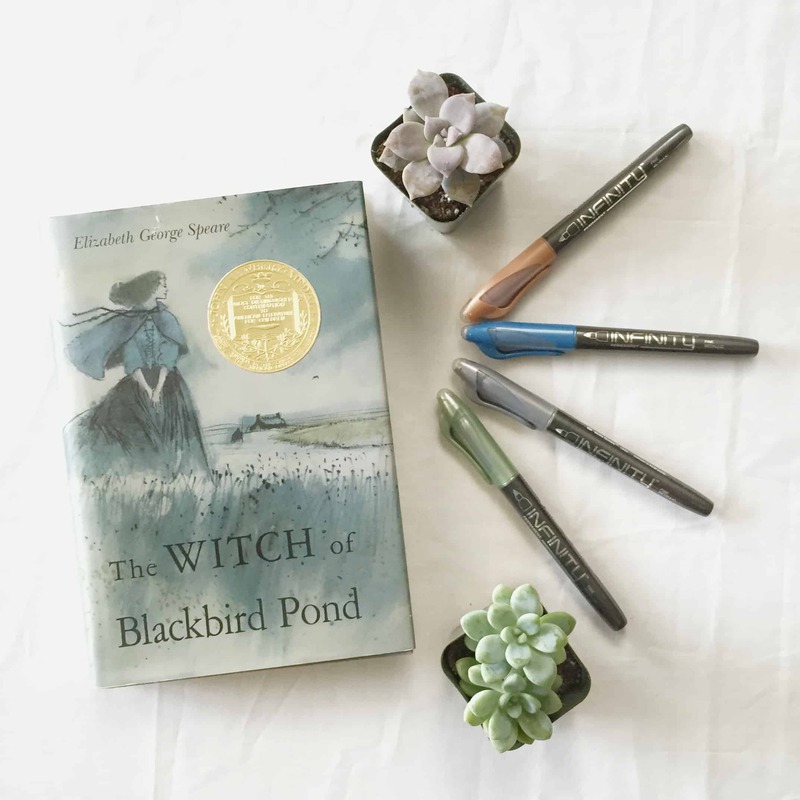 My blog is, among many things, a love letter to my favorite book, The Witch of Blackbird Pond. I’ve been known to go around saying that I’ve read it 11 times, once a year at the bleakest point of my life. While I’ve long since grown out of that habit, I still flip through the book and mouth my favorite passages–some of which I’ve committed to memory. In all my posts about WOBP, I’ve never explained why this book meant so much to me, and why, even now, I clasp it so tightly to my bosom. WOBP is my Red Violin: I’ve carried it with me through all the peaks and troughs of my life. Its calmed me through many a back-to-school jitter, its served as a safety blanket during college when I was afflicted with insomnia and bludgeoned with a bout of self-effacing doubt that I didn’t belong at the university. When I was a spindly thirteen, I read WOBP in the thick of a summer so idyllic it could have been ripped from the pages of a Ray Bradbury novel. I remember sitting under a tree in my backyard, licking a lime popsicle and scratching a mosquito bite on my shin. School was an afterthought and I wiled away an entire afternoon falling in love with Nat Eaton. There’s a dull pang in my chest whenever I recall this memory. No matter how many times I read WOBP in the hopes of recapturing this feeling of sublime happiness, it always manages to elude me. At times, it’s like I’m chasing a ghost or, to be more precise, like waking up in the middle of a wonderful dream and willing yourself to go back to sleep so you could continue, except your mind can’t seem to bookmark the proper place. When I was seventeen, I read it at my grandmother’s house…a few days before she died. It was an ordinary Saturday evening in early March; I was snuggled in a flannel blanket, belly stretched taut from take-out pizza. Acceptance letters from all the UCs were pouring in, as were scholarships; I was at the top of the world and had my whole life ahead of me. I was sprawled on the couch, carelessly flipping pages when my fingers paused and it struck me that after years of being uncomfortable in my own skin, I was finally safe, happy, and almost confident. There was order in the universe; all my planets were aligned. Life was imitating art, in this case, the cozy scene in Hannah Tupper’s cottage just before the witch hunt. Just like Kit, I had a moment’s misgiving that this might be the final time I’ll ever see my grandmother alive. Happiness, life, youth are all fleeting, mutable things and one of the toughest things I’ve learned as I grew up is that you can’t capture it and hold it down. Yet when I read WOBP, I’m eleven, thirteen, and seventeen again. I could spot a phantom glimpse of my younger self between the lines. I don’t have any home movies of my grandmother, all I have are photographs that don’t move me so much as when I read about Hannah Tupper: I see my grandmother and I see that transient ‘thing’ that made her move, laugh, cry…her personality, her soul alive in eternal lines to time. At this point, WOBP and I have joined hands and skipped off into the sunset.